I had a profound healing experience this week (well to be honest I’ve had several profound healing experiences this week – but the others will have to wait for another time! ), but I wanted to share this one as it is such a clear illustration of the healing power we can find in the natural medicine world. 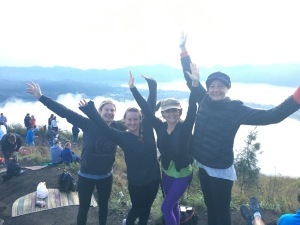 Following a five-day juice fast, a group of us – retreat guests, our amazing yoga teacher & good friend Oksy, and myself – decided to hike Mt Batur. 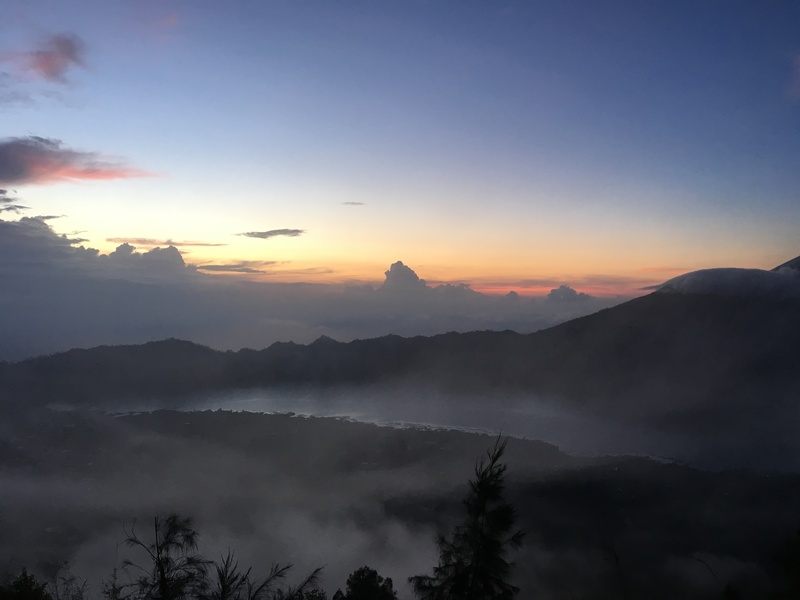 I’ve never hiked Mt Batur, but it sounded like a great challenge and adventure. 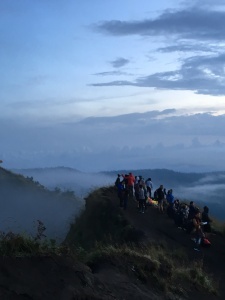 We get picked up from our resort at 2.00am and drive about an hour to the base of the mountain, where we meet our guides and get torches for the hike in the dark so that we can meet the sunrise. 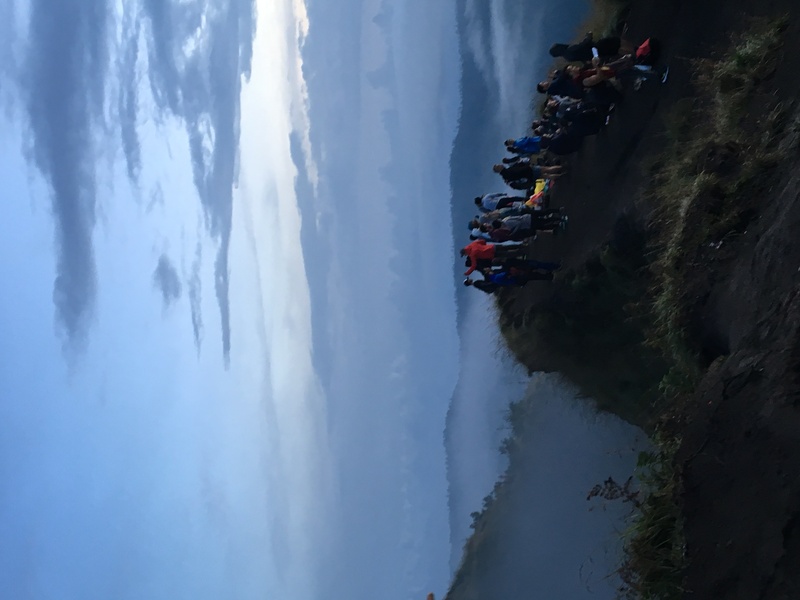 It takes about 2 and a ½ hours to make the 1717m (5633 ft.) climb – and as it turned out it was more of a scramble and climb than a hike. 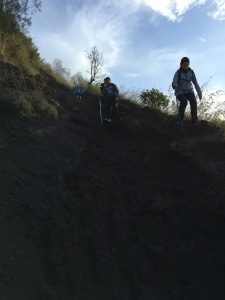 There were hundreds of people making the ascent and we followed in single file over the rough, rocky terrain. Every single footfall had to be placed carefully as there were gravelly rocks that slipped easily, difficult footholds to find on steep rocky surfaces, huge grooves in the mountainside where torrential rains had cut through the dirt, and some places where you could only make progress by scrambling on hands and knees. I was fairly fit, but a little worried about the challenge, especially after fasting for five days – but I and the other three that made it to the very top (another group stopped at one of the lower peaks), did so pretty well. It was only the last fifty metres that was almost straight up that my legs turned to jelly and I truly didn’t think I could go any further. That last push was pure willpower, but I made it and the scene was incredible. It was freezing cold at the top of the mountain and the wind chill factor had us shivering under any clothing and raincoat we could find. The four of us huddled together and waited for the sun to rise. It was spectacular and even though I would rate it as quite a difficult hike / climb, I’d do it again in a second. My husband Dan has done a lot of high level fitness activities and one was walking the Australian Kokoda Challenge a few years ago. I remember him telling me that going down is hard on the knees, but I didn’t quite understand what he meant until this mountain – oh my knees!!! I was in so much pain as soon as we started our descent, that I genuinely thought that I had badly hurt myself. Maybe I twisted my knee on the way up and didn’t realise? Maybe I’d torn a ligament or done some other major damage? 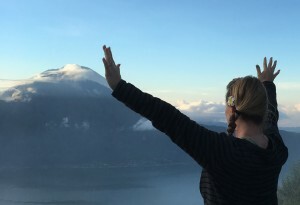 My right knee was sore, but OK, but I was struggling to even move my left knee I was in so much pain – but I had an hour’s walk ahead of me on slippery, steep, rocky terrain, so I did the best I could – there’s only one way down a mountain! Once we got back I was worried. My knee was swollen and I couldn’t bend it at all. I was in a lot of pain and struggling to walk. Stairs were almost impossible and I was starting to believe I’d done some quite serious damage. A few days prior I had been told by Oksy about a secret little spa place that is run by a gentleman by the name of Made, whose grandfather was a medicine man, and taught Made all he knew about herbal medicine. 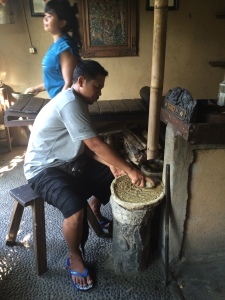 In this little centre, they make up a clay called Boreh – they add 48 different healing herbs and spices by hand, and mix it into a thick paste that is applied to the body following a massage (the massage therapists are also trained by Made to not just massage, but to heal through touch, using acupressure points and different techniques to those normally used in Bali). Once the Boreh is applied, you then sit in a steam-sauna that is powered by a wood fire, and 60 different herbs are infused into the steam so that you breathe them in whilst in the sauna. 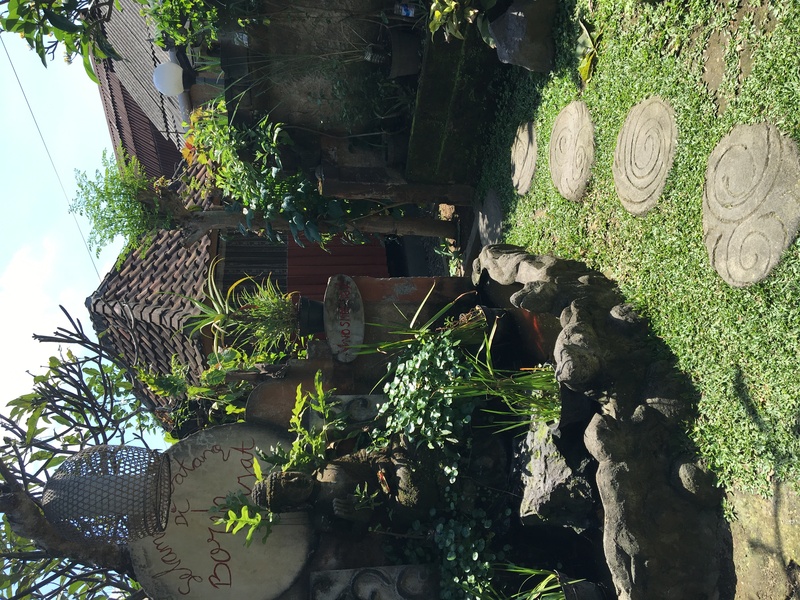 Knowing that I’d be a bit sore and tired after hiking Mt Batur, I booked in for the full treatment. During the massage my knee was very sore and moving from the massage table to the Boreh area was agony. I had the Boreh applied and sat in the sauna. The herbs made the steam smell and taste very unusual – but not unpleasant – and the heat was very welcome after the day’s activities. I stayed in the sauna as long as I could, exited once for a few minutes to cool down and devour a fresh coconut water – before heading back in for another fifteen minutes. After the second session, the miracle occurred. I was standing outside the sauna when I felt my knee on absolute fire. I was hot all over of course from the warming Boreh spices in the clay, and the sauna – but this felt different. The fire was deep within and emanating out from my knee. It didn’t feel bad; it was just unusual. I got chatting with Made and forgot about it for a few minutes and then it seemed to ease off. And then I got up and walked to the shower with absolutely zero pain or stiffness! My knee felt 100% and I didn’t even feel like I’d been up the mountain at all. And it stayed. 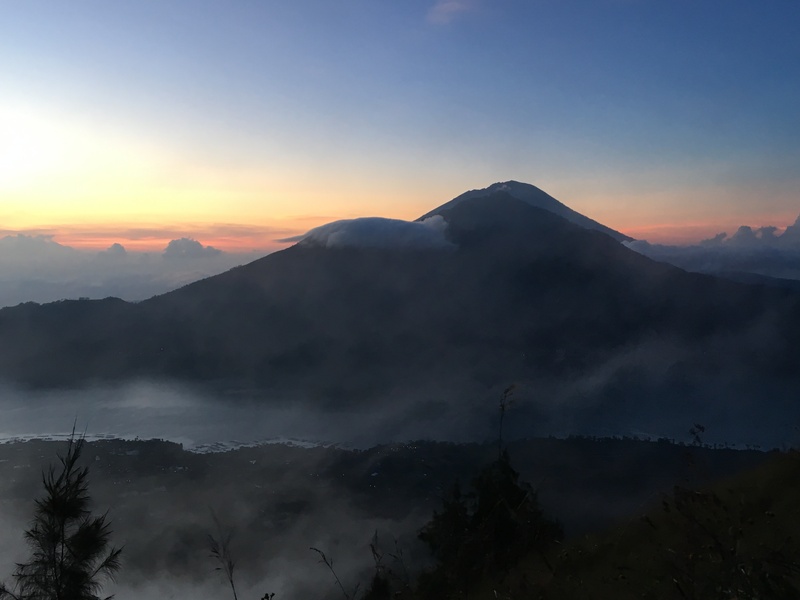 Over the next few days I felt the slightest ache from all the exercise, but even that was so mild it was almost non-existent, and I felt like I could hike Mt Batur again tomorrow! Most of the other hikers were stiff and sore with various aches and pains, but for me, the treatment I had was a healing miracle. I really thought I’d hurt myself, but the magic in the combination of massage, Boreh and sauna did absolute wonders. 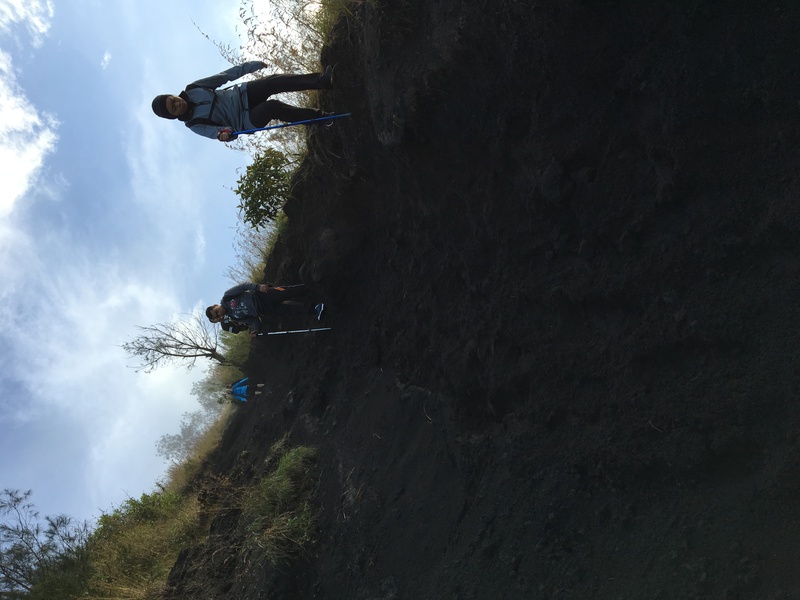 If I ever climb Mt Batur again, I know exactly where I’ll be heading as soon as I get down – injured or not. This is the power of natural medicine, of feeding the body, of using methods that nurture, support and heal, that work with the body, not against it. 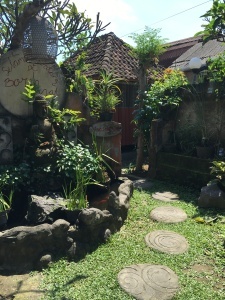 This is the philosophy and the underpinning concepts of all that we do at the Embracing Health Retreats, by juicing, doing massage, colonics, yoga, herbs, supplements, food as medicine, emotional healing and release, we allow the body to take what it needs to cleanse, heal and move back towards a place of balance. There is magic in the work we do, and huge shifts in physical and emotional states are normal during a retreat such as this, not rare. I myself was full of wonder and awe at my own healing miracle this week, and so grateful to have this incredible treatment right here at my fingertips. Thank you Bali. When faced with a personal conflict, relationship or family troubles, or a mental health condition such as depression, stress, or anxiety, many people turn to a therapist for help. Find a child therapist and counselor by location and specialty in your city and contact through Email or Phone. Natural medicines are always helpful to cure any kind of disease so as hair loss. Permanent hair loss can also be treated with hair loss but hair transplant is the bet way to treat hair loss. Bali is a beautiful place indeed, thanks for sharing these memorable trip of you. Mind and body can be healed automatically and naturally if we are stress free and at such a beautiful natural place, because self-healing mechanisms of the body attempt to restore health without even doing any artificial efforts . 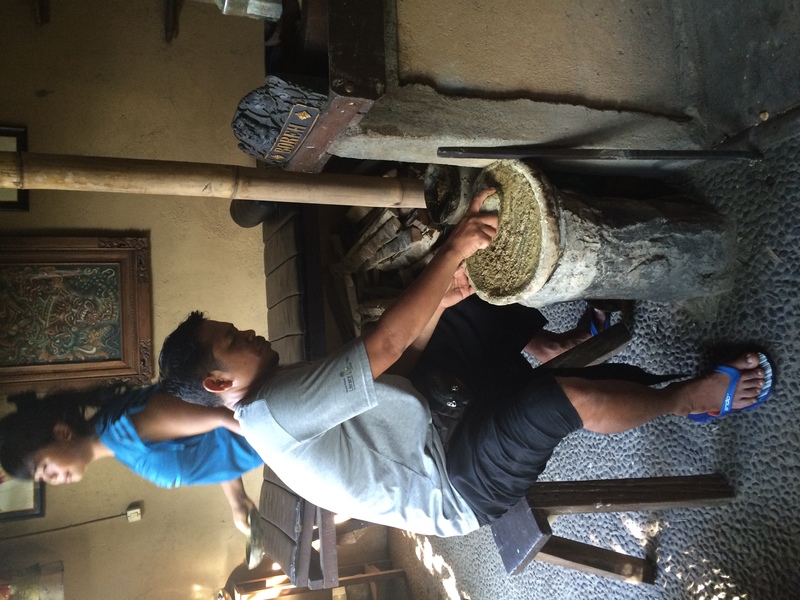 This is a wonderful experience and example that you have shared with us. I will keep on reading such beautiful experiences of you in future as well. Thanks for this.